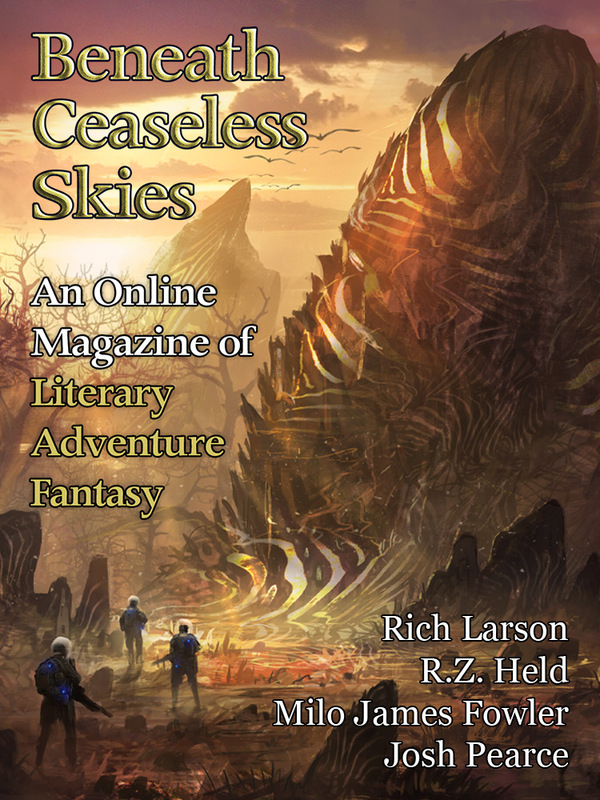 Special double-issue for BCS Science-Fantasy Month 4, featuring two bonus stories and science-fantasy cover art “Ugg” by Florent Llamas. All of a sudden there’s an enormous black cube filling up the sky above them. No thunderclap, no sound at all, it just appears. The cube is like nothing she’s ever seen, an enormous black box composed of a thousand shifting slivers breaking and melding, rippling, almost liquid. Blinking red sensors swarm around its edges like flies. Vertigo swamps her, and she retches. The cube is like nothing she’s ever seen, an enormous black box composed of a thousand shifting slivers breaking and melding, rippling, almost liquid. Shiny metal bloomed out and out from her touch and the red rust disappeared. Her heart sped and it felt good. Not from fear, but... satisfaction? Tarnish sought the right word like in a prayer and it came to her. Euphoria. She jerked her hand back, but the next instant she wanted more. She needed more, that little bit hadn’t been enough. Shiny metal bloomed out and out from her touch and the red rust disappeared. She needed to be among her own kind again. But not ones like those who had programmed her. No, she needed to live with a peaceful group of survivors, a human community left untainted by the rebels, untouched by the Spliced. Perhaps somewhere out in the wilderness, there might be people with no connectivity. Off the grid. Humans who had not seen the broadcast of Dahlia's feast. No, she needed to live with a peaceful group of survivors, a human community left untainted by the rebels, untouched by the Spliced. "What the damn hell, child?" She points at the shadows alongside the track, which are turning silver-liquid and flowing down the hillsides towards us. Standing up and looking at us. Something odd about these bandits, odd about their skin, which crawls with a life of its own as they move about along the train cars, stretches of skin being pulled off in big, looping Lorentz tangles. She points at the shadows alongside the track, which are turning silver-liquid and flowing down the hillsides towards us. Standing up and looking at us.